CULLMAN – Despite a chilly morning, spirits were high as the Cullman County Bosom Buddies Foundation’s Colors for Cancer Day kicked off Saturday. Participants from all over the county came for the morning's 5K run, showing their support for those who live with or have died from cancer. Once everyone was back at the fairgrounds and running times were compared, the awards for best times were given to the fastest man and woman in each category. In the 13 and younger division, the medals went to Christopher Putman and Carrington Chambers. For ages 14-19, Alex Wood and Kennedy Chambers took the gold. Ben Swan and Caycee Overton won in the 20-29 category, and prizes for 30-39 went to Wes Harding and Carla Caudle. In the 40-49 age group, Steve Harbison and Beth Parker received the awards. For 50-59, prizes went to Tim Aris and Tammy Baker. Eddie Lewis and Ann Smith won in the 60 and older division. Finally, the prizes for best overall went to Champ Crocker and Abagail Kusz. After awards came a break as visitors waited for the parade to arrive. 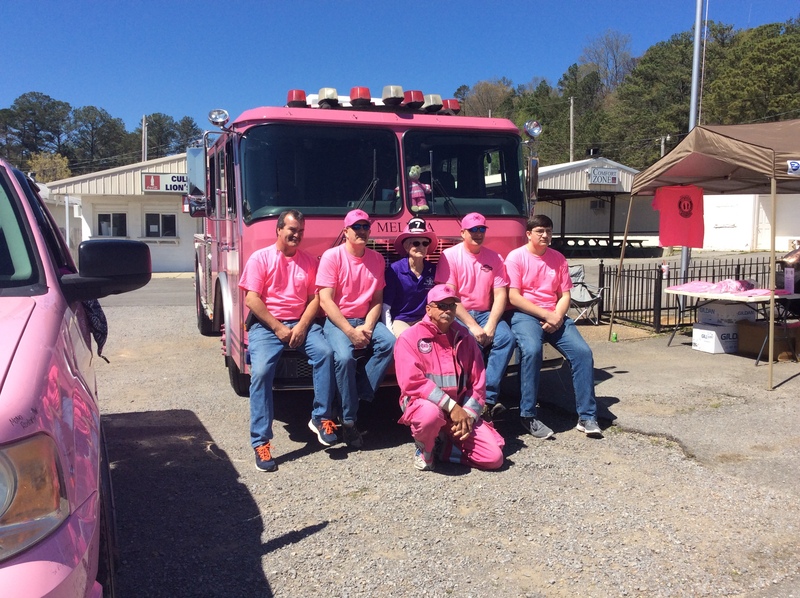 Starting with a Pink Heals fire truck and ending with a Pink Heals police car, the parade consisted of the Hanceville High School Bulldog Band, the West Point High School drum line, a line of classic cars and several other participants. After their arrival, the Hanceville and West Point drum lines got a break to catch their breath and set up their equipment for their big drum-off. During the lull, all guests were welcomed to the event and given a quick introduction to different individuals who either organized the event or volunteered their services. At their last meeting, the Cullman County Commission proclaimed the first Saturday in April “Colors for Cancer Day” in Cullman County, so the Cullman Mayor Woody Jacobs followed suit, making the same proclamation for the city. Next, a representative from the central Alabama chapter of Pink Heals took the stage to talk about his organization and how they help people with cancer, then invited the crowd to come sign their vehicles in honor or memory of loved ones with cancer. With a few last comments from the announcer about how the grounds are set up, the drummers were ready to start. The Hanceville and West Point players gave each performance their all, taking turns playing their cadences before coming together to perform one final cadence as one drum line. Their performance was followed by a series of dances from the Silver Spirit Kickers, a dance line for older women. Following them, Wayne Abbott was welcomed to the stage. Abbott, a Willie Nelson tribute artist, treated the audience to Nelson classics like "On the Road Again" and "Our Time Slips Away." As he sang his last few songs, he invited the Wallace State Community College jazz band to begin setting up on the stage behind him. Under the direction of Ricky Burks, the jazz band opened with a stunning rendition of "Moonlight Serenade," before moving on to a fast-paced and lively piece entitled "Kansas City." A bit of humor arose as the players struggled to keep their music from blowing away between songs, but it didn't affect any of their incredible performances. Their various selections featured solos from talented players such as Nick Watford on tenor saxophone, Kimberlyn Compton on alto saxophone, Gracie Bailey and Becky Finley on trumpet, Daniel Leach and Baylee Mallon on trombone, Brooke Sinyard on piano, Hannah Crider on clarinet and Thomas Baker on drums. The group closed their act with a marvelous performance of Louis Armstrong's "What a Wonderful World." As the day drew to a close, the last thing on the schedule was a balloon release. Each balloon was in honor or memory of someone with cancer, and releasing a colorful array of them into a cloudless sky ended the day’s festivities.